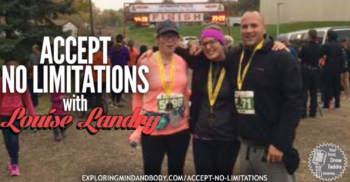 Drew Taddia, host of Exploring Mind and Body interviewed Louise Landry this week on Accept No Limitations, and Radio Laurier. Louise Landry is nothing short of inspirational as we talk about how she will accept no limitations. At age 56, a stroke survivor and more active than people half her age, Louise continues to push her limits and inspire those around her. As a stroke survivor and limitations in eye sight and her left arm Louise doesn’t let anything hold her back, in fact you might say she does more than the average person regardless of what limitation might be put in front of her.